Tis the high holidays of horror: Samhain, Dia de los Muertos and Guy Fawkes’ Day. Here’s a trinity of new fiction releases to get you in the spirit of the season. While I enjoy the occasional police procedural or detective tale, I find it difficult to relate to those worlds. As a writer I see the appeal of having a strong, resourceful protagonist whom you can throw into high-drama situations knowing they can believably fight their way out of it. But as a reader, I’ve always been drawn to the blue-collar characters who stumble in over their heads. Enter Jay Porter. He’s a menial laborer living paycheck to paycheck, burdened by stress, bills and an estranged lover and their small child. Porter lives in a remote, oppressive town, cut-off from civilization by the New England winter. Clifford so ably captures this world that it made me uncomfortable. From the opening scene, I felt edgy, depressed. I carried the full weight of Porter’s burden as my own. That’s some damn fine writing. That uneasy feeling in the belly swells when Porter is called down to the police station to pick-up his drug-addled brother, who is spouting off conspiracy theories involving town elites. It is further evidence of his brother’s decline, he believes, until his brother’s business partner turns up dead. As he wades deeper into the fog, Porter unearths a dark secret that puts the life of himself and his brother in danger. With limited funds or capable weapons, and zero well-placed connections, Porter must rely on a loyal friend and an old rival. 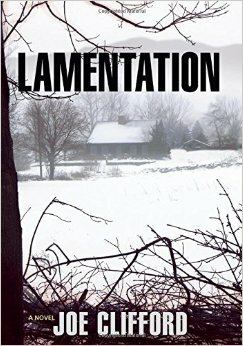 Lamentation is my kind of novel. There are no experts, no sharpshooters, no aces in sleeves. There is no posse to rescue the hero. Just a quartet of hard-luck locals with long odds up against the wealthy, powerful and corrupt. Porter is not the most likable character, or self-aware, but you’ll be rooting for him throughout. I’m already excited for the sequel, December Boys, due out next summer. Speaking of blue-collar heroes, meet Meg Harris, star of Harlick’s series of thrillers set in remote Canada. It may be the holidays, but merry-making is not on her list. Rather Harris is stewing over a blowout fight she’d had with her husband. Now he has left, and she is certain he won’t return for a few days. Outside, a snowstorm rages, knocking out the power. Harris is alone with just her lapdog, Shoni, and the neighbor boy from the reservation. Then comes a knock on the door. It’s two men in distress, and, well, it wouldn’t be much of a plot if she didn’t let them in! Home invasion tales can quickly turn blasé, but Harlick infuses this time-worn trope with fresh life. She raises the stakes by revealing the complexity of the two men. One of them, who grew up on the nearby Migiskan Anishinabeg Reserve, knows Harris’ great-aunt. He’s a local. They have common connections, and the reader wants nothing more than for things to go well. Harlick is brilliant at creating and sustaining tension, and she keeps us on edge throughout what is essentially a single-set play. 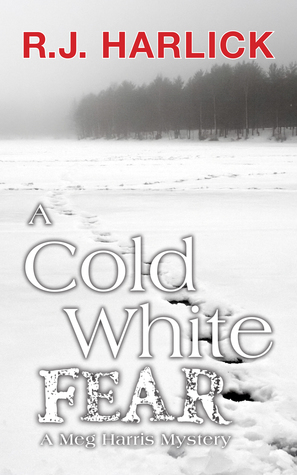 A Cold White Fear (publishing date Nov. 7) is like a rough acid trip. You know you’re going to survive it, but you’ll have to white-knuckle it all the way. While I recommend this book for any fan of suspense, horror or cold-weather claustrophobia, I did mark it down from a five-star rating to a four due to some plot and character turns in the latter chapters. Harris is a strong, resourceful character throughout the story. Vulnerable, yes, but self-sufficient, and I think she gets short-changed in the end. Harris is not someone who needs rescue. She uses her wits and courage to navigate a harrowing scenario for most of the book, and the ending doesn’t read true with the rest of the narrative. Despite that, I give A Cold White Fear a strong recommendation. Others may feel differently about the ending, and even though I wasn’t crazy about it, it was worth the ride. This was the first Harlick book I’ve read, and I look forward to reading more Meg Harris mysteries. Man Made Murder is a high-octane thriller for those who like their horror on the supernatural side. Dean Thibodeaux is talented, but frustrated guitarist (for the band Man Made Murder) who just wants to score some biker weed before the group begins its next tour. There is a symmetry to what comes next. His band is changing… and then so is he. But into what? I’ll just say that Type O Negative would’ve killed for Dean’s street cred after his throwdown with the biker in a creepy old house. Dean’s transformation sets him on a collision course with revenge-minded Carl Delacroix. 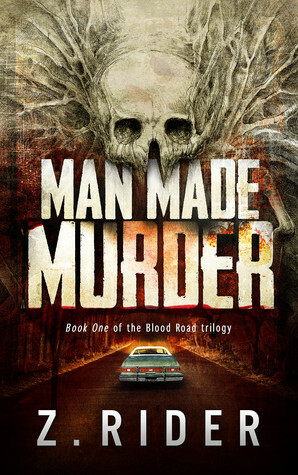 Man Made Murder is a rock and roll horror show and act I in the Blood Road Trilogy.